Although they didn’t have many scenes together, CN Blue’s Lee Jong Hyun gave a special gift to SBS’ A Gentleman’s Dignity co-star, Kim Jung Nam. As the show continued, Lee Jong Hyun made a surprise appearance to cheer Kim Jung Nan on during the filming. Lee Jong Hyun came with his guitar and gifted the actress with a special song, making the hearts of all the ladies in the studio. 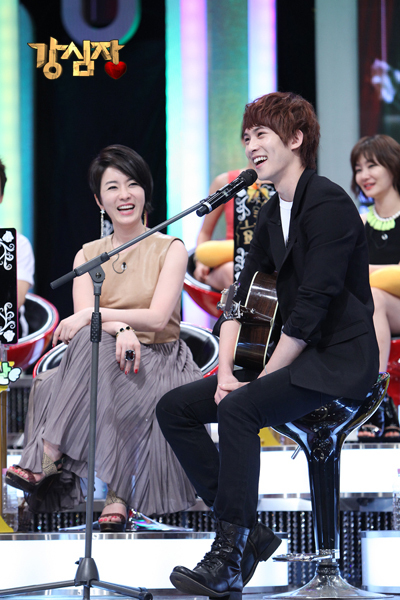 Kim Jung Nan, touched by Lee Jong Hyun’s appearnce, admitted that she fell in love with him when she saw him play the guitar and singing during the filming of A Gentleman’s Dignity. A few minutes after she received a heartfelt and beautiful serenade from CN Blue’s Lee Jong Hyun, Kim Jung Nan of SBS’ A Gentleman’s Dignity bashfully confessed that she loves SHINee’s Onew and Big Bang’s G-Dragon. Appearing on the August 22 broadcast of SBS Strong Heart, Kim Jung Nan was met by Lee Jong Hyun as a surprise guest. Kim Jung Nan had endless compliments for Lee Jong Hyun, and as a reply, he serenaded her with Juniel’s Illa Illa. Kim Jung Nan then went on to share that she told Lee Jong Hyun that she liked Onew. CN Blue’s Lee Jong Hyun’s above average beauty has caused confusion in the past and now he’s making sure to clear the air. Lee Jong Hyun arrived on the set of SBS’ Strong Heart as a surprise for Kim Jung Nan, who acted in SBS’ A Gentleman’s Dignity with him. There, another celebrity commented that Lee Jong Hyun looked like he popped right out of a comic book, while Shin Dong Yeop added that Lee Jong Hyun looks sort of mixed. My baby finally appears in a variety show, ALONE. Thank you so much AGD. Cannot wait to see him performing Illa Illa live with his guitar. The continuation of previous week episode, only 25 minutes. I have to split the file into two because KBS World airs the episode in parts due to commercial break.